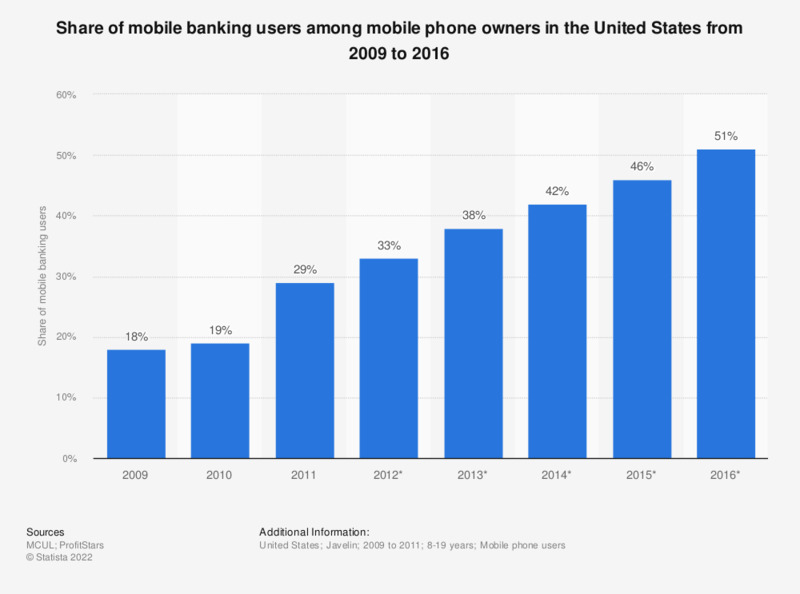 This statistic presents the share of mobile banking users among mobile phone owners in the United States from 2009 to 2011 and a forecast thereof until 2016. In 2011, 29 percent of the mobile phone owners accessed banking services on their mobile phones and this number was predicted to increase to 51 percent in 2016. Mobile phones are one of the most popular devices owned, and are used for personal and business purposes by people worldwide. In the United States, the mobile phone penetration rate reached 78.1 percent in 2013 and 81.5 percent of the population was predicted to have a mobile phone by 2018. Following the development of smartphone technology, mobile banking is gradually becoming a more popular channel of client communication with banks. The number of mobile banking users in the United States was projected to increase from 57 million in 2011 to 111 million in 2016. The use of mobile banking is most popular among users in the 18-29 age group. The most common activities related to mobile banking are checking account balances or recent transactions, downloading mobile bank applications and transferring money. Although the possibility of accessing bank services in any place is very convenient, a lot of people decide not to use this option. Reasons for not using mobile banking services include transaction security concerns, lack of necessity to use mobile banking as traditional banking channels meet the customer’s needs, and inconvenience of performing banking operations on the relatively small screen of a mobile phone.